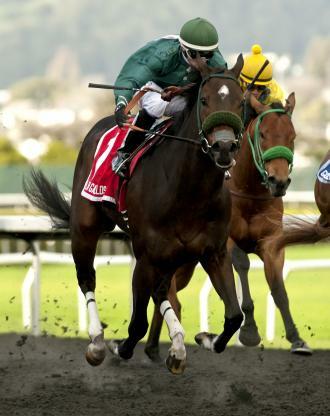 Zakaroff scored a huge upset in Grade 3, $200,450 El Camino Real Derby, getting a half length victory at nearly 49-1. Zakaroff took the the 1 1/8-mile race in 1:51.34. More Power to Him was moved up to second from third after the disqualification of Ann Arbor Eddie who finished second while impeding Tribal Storm. Zakaroff relaxed early and dropped back down the backstretch. Frey moved his mount out in the lane and was finishing strongly. Winning trainer Steve Specht was surprised at the outcome, “It’s a horse race, you never know,” said Specht. Zakaroff, a gelded son of Slew’s Tiznow, was bred in Kentucky and was a $25,000 yearling purchase at the October 2015 Barretts sale by Antone Metaxas. Greg Gilchrist assisted Specht in picking him out. The victory was worth $120,000, bringing Zakaroff’s career earnings to $148,120. More Power to Him, another son of Slew’s Tiznow got the place money of $40,000 and is now multiple stakes placed and an earner of $112,593. More Power to Him was foaled and raised at Rancho San Miguel for his connections.